He'll love his gift. You'll look like a genius. We have the best gift ideas for men. You don't need to worry about finding a great gift for him again. Ever. So relax - you're going to find a great gift for him. 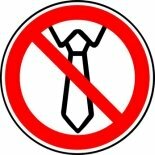 You may have noticed that we have a strict "No ties" policy. Ties are lame. You want good ideas, right? Well, there's your first one - skip the ties. His next present from you will be fun for both of you. Imagine his face lit up with excitement. You gave him a gift he really wants - a gift that makes him happy. Now, doesn't that feel great? Shopping for men isn't always easy. Don't worry - we're here to help you find cool gift ideas for him. We only recommend products that a man will like. That's easy for us, because we're men! Stick with us, and you're going to make someone very happy. As a bonus, you'll look like a genius. We scour the web for you, looking for the best presents from top online merchants. We show you only the cool stuff for men that we'd want for ourselves. We organize it, categorize it, and make it easy for you to find and buy the ultimate gift. We even show you last minute gift ideas. We have great birthday gift ideas for men of all ages. We also have traditional anniversary gifts and modern anniversary gifts , both organized by year. We're adding new stuff every day, so check back often. Would you like to share your knowledge about gift ideas for men? Would you like to share your knowledge about gift ideas for men? Contribute to www.my-gift-ideas-for-men.com!